Metal Cleaner Poisoning is caused by the ingestion of metal cleaners, which form a wide range of products. The cleaning fluids may also get into one’s eyes or affect the skin, and cause irritation and pain. What is Metal Cleaner Poisoning? Metal Cleaner Poisoning may be referred to as Metal Cleaner Toxicity. What are the Causes of Metal Cleaner Poisoning? Metal cleaning agents may contain many toxic chemicals, such as acids and alkalis, depending on the type of metal being cleaned. These include boric acid, citric acid, phosphoric acid, sodium hydroxide, hydrocarbons and organic compounds, such as butanol, dimethoxymethane, butylene oxide, propyl bromide, etc. What are the Signs and Symptoms of Metal Cleaner Poisoning? How is First Aid administered for Metal Cleaner Poisoning? Who should administer First Aid for Metal Cleaner Poisoning? 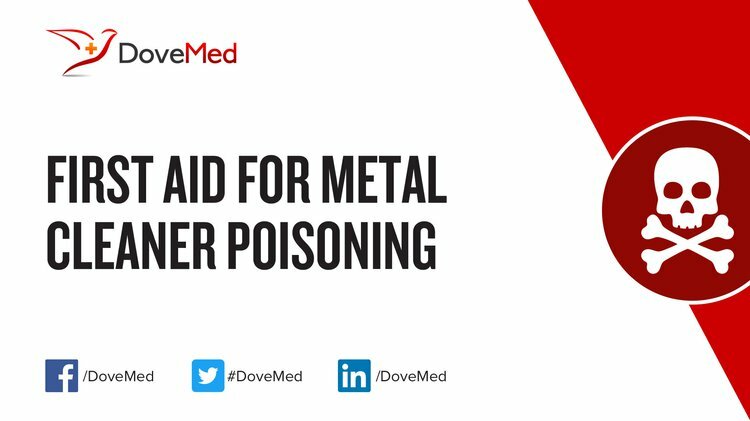 First aid for Metal Cleaner Poisoning is administered by healthcare professionals. What is the Prognosis of Metal Cleaner Poisoning? How can Metal Cleaner Poisoning be Prevented? Özcan, M., Allahbeickaraghi, A., & Dündar, M. (2012). Possible hazardous effects of hydrofluoric acid and recommendations for treatment approach: a review. Clinical oral investigations, 16(1), 15-23. Duan, N., Dan, Z., Wang, F., Pan, C., Zhou, C., & Jiang, L. (2011). Electrolytic manganese metal industry experience based China’s new model for cleaner production promotion. Journal of Cleaner Production, 19(17), 2082-2087. Ozalp, N., Epstein, M., & Kogan, A. (2010). Cleaner pathways of hydrogen, carbon nano-materials and metals production via solar thermal processing. Journal of Cleaner Production, 18(9), 900-907. Förstner, U., & Wittmann, G. T. (2012). Metal pollution in the aquatic environment. Springer Science & Business Media. Chen, J. P. (2012). Decontamination of heavy metals: processes, mechanisms, and applications. Crc Press. Robinett, D. A., Shelton, B., & Dyer, K. S. (2010). Special considerations in hazardous materials burns. The Journal of emergency medicine, 39(5), 544-553. Hosseini, M. G., & Momeni, M. M. (2012). UV-cleaning properties of Pt nanoparticle-decorated titania nanotubes in the electro-oxidation of methanol: an anti-poisoning and refreshable electrode. Electrochimica Acta, 70, 1-9.